As the world is moving towards the green initiative, fuel-efficient cars are picking up in global market. Apart from being environment friendly, fuel efficient and easy to handle small cars have lowered the bar for car ownership. Consumers in emerging markets are riding on the wave of 'small cars'. India is at the center stage of this revolution with path breaking initiatives on small car design, development and production. In the first wave of small car growth, Suzuki and Hyundai identified the demand from Indian middle class. Later it took an Indian company to come up with a truly 'Small car' initiative, 'Nano'. Tata Nano has entered the hall of fame for revolutionizing the small car segment, similar to the way Henry Ford revolutionized the manufacturing. In the following year, a lot of major global automotive companies started doing end to end development or production of small cars out of India. Hyundai, GM, Renault, Nissan, Honda, Daimler, Skoda, Suzuki, Toyota and many others are involved in leveraging the India advantage in some way or other. Hyundai has made its Chennai based facility as the prime supply base for small cars (i10, and i20) to global markets, and has already announced an 800 cc car for Indian masses as well as exports. Small Car and Developing Market will drive the future market: Developing Market will produce the next wave of demand for cars, and small cars are expected to account for the largest chunk of it. 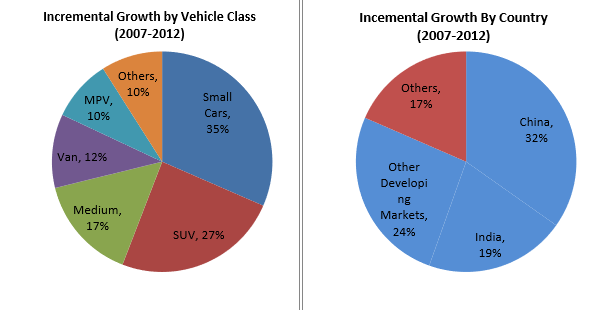 83% of the incremental demand for small cars in 2007-12 has come from developing markets. Out of this 65% of the cars sold has been in small car category. The Case of Nano, A Car for Millions: Indian car maker Tata motors have come up with a car which has captured the imagination of millions across the world. Tata looked at the huge price gap between two wheelers and cars as a potential opportunity. The target customers of NANO were millions of people who were not able to afford the car but needed a safe transportation system. Tata Motors, in association with its suppliers, took the challenge to come up with a USD 2500 (INR 100,000) car. Tata innovated and improvised in the entire value chain of car production, from design, development and manufacturing to supply and marketing. The result was advanced booking of more than 200,000 NANOs within a month, which enabled Tata Motors to raise INR 2500 Crores (USD 500 Million). CEO of Renault Nissan highlighted the efficient management of resources which Indian engineers bring to the table. 'What an Indian engineer promises to do with one, my engineer tells me we need five to complete'. 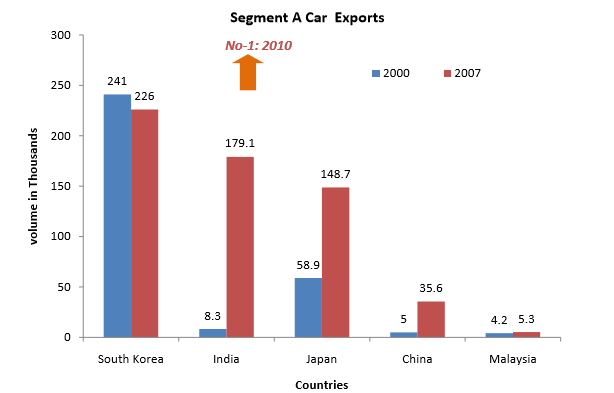 By 2010 India will be the leading Exporter of Small cars: It is expected that in 2010 India will surpass South Korea as the biggest exporter of the small cars. Indian auto sector has long been known for traditional innovation in design, process, and automation etc. But the last few years saw ground breaking innovations in financing and marketing methods. Tata Motors announced the booking of its awaited Nano much in advance so as to arrange for the working capital. There seems to be much greater scope for similar innovation coming from other automobile companies. Increased focus on business intelligence and analytics: Companies such as TVS Motors have realized that a lot of value can be realized from customer/supplier data analysis. By setting up their analytics division, companies can now hope to capitalize on valuable information bank that they currently reside on. Continued focus on cost-cutting: Cost cutting and operational efficiencies are not the words that are going to go away with the recession. This recession has provided an opportunity for the auto manufacturers to look critically at their cost structures and this mindset will serve the industry well for the coming years. Increased involvement of OEMs with suppliers: OEMs have proven to be important strategic partners for the smaller and vulnerable auto-component manufacturers. Exclusivity clauses in supplier relationships will tend to increase as OEMs use their increased bargaining power over their suppliers. Tap quality managerial talent: Traditional sectors such as manufacturing have returned to be one of the major recruiters in the Ivy League campuses across the country. With innovation and analytics being major value drivers in the industry, tapping up more quality talent for mid-level managerial role will prove to be an important differentiator for the companies. Build strong relationships with suppliers: Most auto component manufacturers have been in precarious position for the last year or so. Some have shut down their operations and others have just cut capacity. Since building capacity for the next operations is not going to be instantaneous, OEMs should clearly prioritize their sourcing strategies and start augmenting their capacity. Carefully choosing their suppliers and providing them working capital is going to be crucial. Increase localization of the sourcing chain: There are several benefits from pursuing localization for most parts of the manufacturing chain. Firstly, it can help reduce costs in transportation and handling. Secondly, companies can be made neutral to exchange rate fluctuations. Moreover, supply chain becomes easy to manage since the lead times are generally small for localized suppliers. OEMs such as Maruti have started pursuing more localization and have reaped major benefits from the same. The hugely successful Maruti 800 and Alto models now have 95% parts being manufactured in India. More investments in flexible manufacturing and quick response systems: Flexible manufacturing systems can provide the manufacturers the much needed flexibility in managing manufacturing resources and time in this time of uncertainty. Not everything in an automobile manufacturing can be made flexible or responsive but a move towards innovation in that direction is warranted and required. Cheaper marketing campaigns: Even though companies should never cut down their marketing expenses, but the time has come to become more innovative in running automobile marketing campaigns. Advertisements with mega movie stars may not be the most effective use of the marketing money.